If I should name my favourite pieces for summer, 2017 it will be anything with ruffles, backless or back details and drop off shoulder clothing. Here I am again in my full black outfit which I have highlighted it with a neck scarf. This past weekend I have been wearing various outfits styles with drop off shoulder tops (not planned!). And now let me share with you the ways you can wear them. Drop down t-shirts and blouses are sophisticated piece of wardrobe. They highlight the nice features of a women beauty, such as collar bones and a neck. Have you catch up all outfits on my Insta stories? If not, follow and stay tuned to see more of shoulder drop down top inspiration! 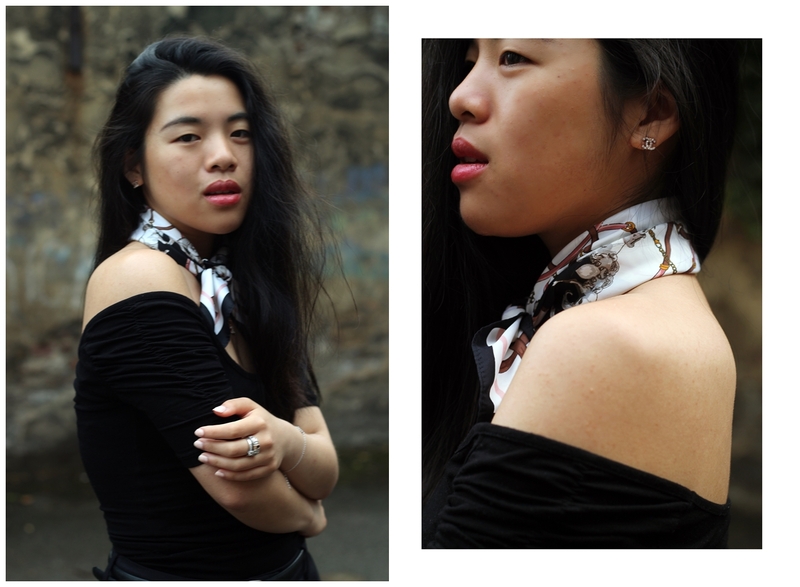 Wearing Tally Wejl black drop down top, black culottes from Calliope and H&M neck scarf. This look is to die for! ♥ Diggin' the scarf around your neck!